Hi all, hard to believe but it's day 12 of #the100dayproject and I'm still going, totally surprising myself here since sticktoit-ness is not one of my strong points LOL! 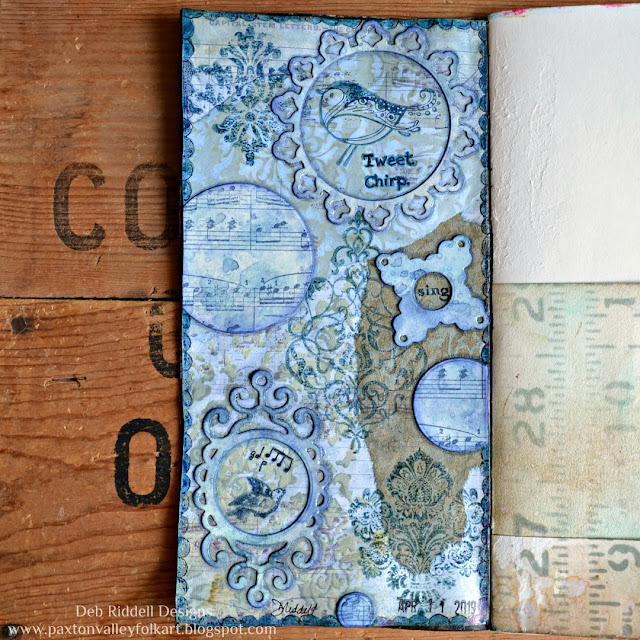 Here's a quick recap of my #100daysofartjournaling makes for days 7 through 12 (you can see day 1 here and days 2 through 6 here). 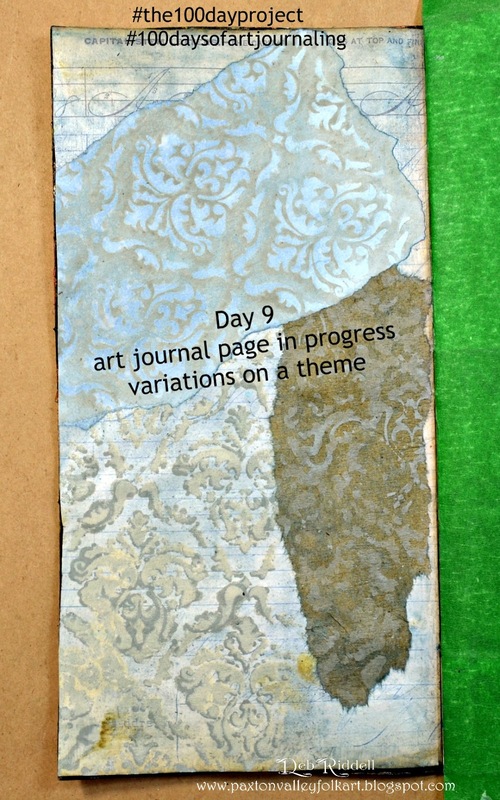 Started an art journal page for day 7, clear gesso and translucent blue paint on the background with random stamping. I started to stamp Tim Holtz's Noble Gent stamps on the background but they were getting lost so I decided to stamp The Gent again onto Distress Mixed Media Heavystock and fussy cut. Then had the idea to add some gears so die cut them with Tim's Gadget Gears Bigz die and just placed them on the page to see if I liked it or not. Left it to contemplate overnight! Flight Of Ideas art journal page for day 8, finishing up the page I'd started the day before. I stamped and fussy cut the light bulbs from Tim's Noble Gent and The Professor stamp sets and also cut out the propeller blades from the Professor set and adhered them to the largest light bulb. Added some button thread to the other light bulbs and wrote some sayings related to the creative process, my pens were not happy writing on this page (think it was the clear gesso?) so it came out messy but que sera, sera! Start of a page for day 9, I started out with some paint resist through Tim's Gothic stencil and then made a stencil monoprint onto another piece of paper with the paint left on the Gothic stencil. I then adhered it onto the page along with a fragment of the paper towel I'd used to blot the stencil while monoprinting. Variations on a theme! Rhapsody In Blue art journal page for day 10, completion of the page I'd started the previous day. 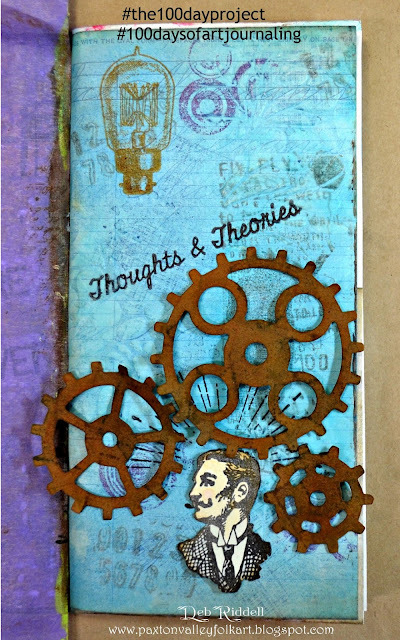 Stamping with Tim's Distress Damask stamp and then die cut Spellbinders Ironwork Accents dies from card coloured with several shades of blue Distress Inks. 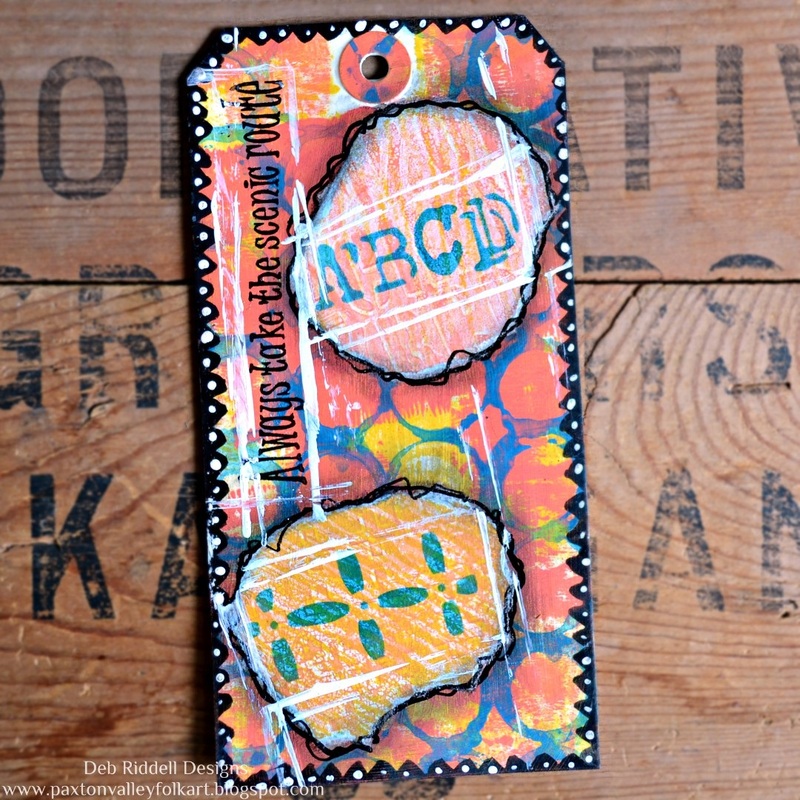 I cut a window out of each of the die cuts and stamped the circles with a music stamp from my stash. The largest bird top right is a wood block stamp from my stash along with the 'tweet chirp' from Dina Wakley's Scribbly Birds stamp set and the rest of the stamps inside the die cuts are from a discontinued Crafty Secrets stamp set. Played with a little hexagonal Gelli Arts gelli plate for day 11, I've had it for ages and have hardly used it at all but I've got a larger Gelli Plate on order so figured I'd best start mucking about and figure out how to use it LOL! 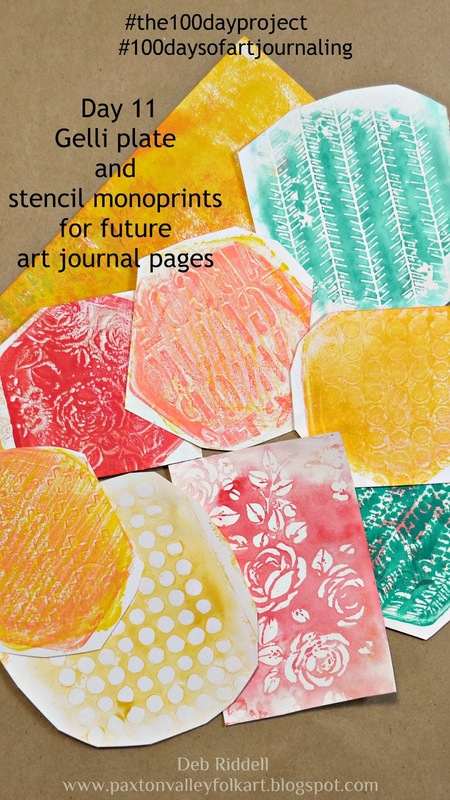 These papers will be used on future art journal pages. Used Distress Paints and many of Tim's layering stencils to make these gelli plate prints and stencil monoprints. A mixed media hang tag for day 12, using some of the Gelli Plate printed papers from the day before. I 've got some tag pockets in one of my art journals so challenged myself to make a hang tag using colours I usually stay far, far away from! The background is brayered Fossilized Amber, Mustard Seed and Abandoned Coral with a Ringer stencil monoprint in Mermaid Lagoon. Never ever used that colour combo before but have to say I like it! 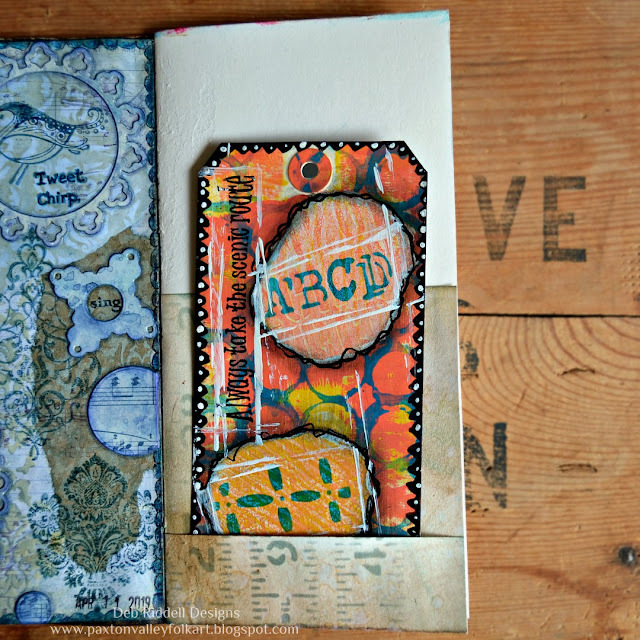 Collaged bits of the Gelli Print papers, stenciled with Tim's Typo and Dyan Reavley's Alphabet Border stencils and sentiment stamped with the Classics #16 stamp set. Credit card lines and Posca pen doodles. So that's it for now, having a lot of fun doing this! I'll be back in a few more days with another update and until then, happy creating! 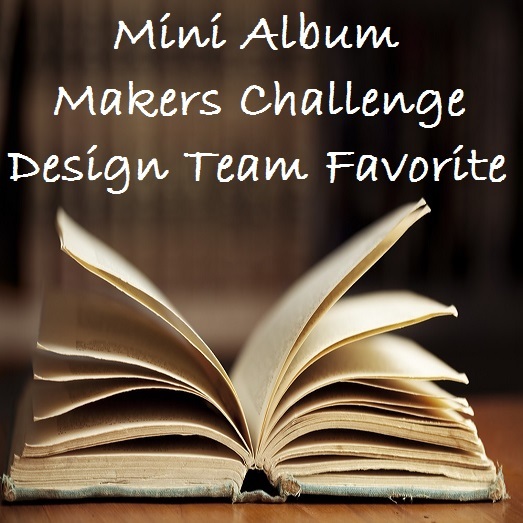 I'm a Creative Guide at A Vintage Journey! 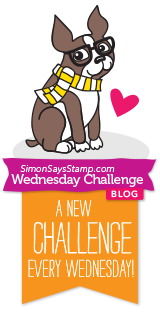 Click here to join Mixed Up Creative for weekly mixed media inspiration, tips, tricks,tutorials, real time workshops and freebies. I'm a Resident Tutor at Mixed Up Creative! I'm a Design Team member at Therm O Web! 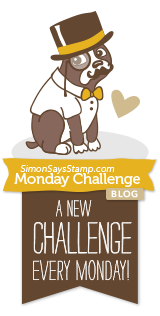 I Play At The Following Challenge Blogs, Come Join The Fun! I may receive compensation and/or discounts from the companies I design for and compensation from affiliate links but rest assured I will never recommend anything that I do not support wholeheartedly. They are the loves of my life! Welcome to my blog. 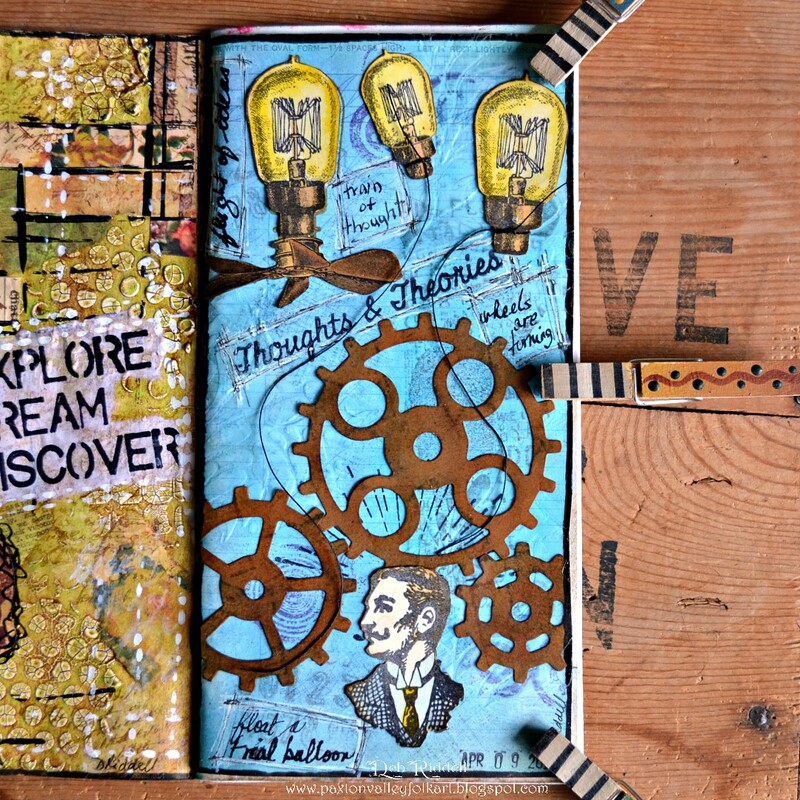 My name is Deb Riddell and I love to create with paper, paint, ink, canvas, found objects and most anything that comes my way. Mixed media is my current passion and my style is grungy vintage although I love to explore many other artistic styles and themes. Come join me on my creative journey!